Nashville’s sits in the Central Basin and this glorious spot, where the Great Plains meet the Appalachians, and gets weather as unique as the town that sits amidst the curves of the winding Cumberland River. Spring storms launch off of the Highland Rim and dive into the basis with great force. Spring storms are the perfect time to witness this phenomenon. These storms bring strong winds, torrential rain, hail and sometimes tornadoes. 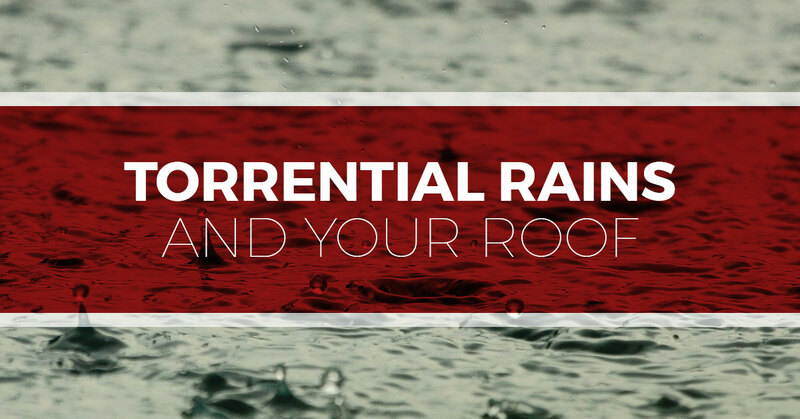 In this week’s blog, we’ll look at how these rains can affect your roof. In our last blog, we covered the effects that strong straight line winds can have on your roof. If you haven’t read it yet, click here. Under normal conditions, asphalt shingles are able to withstand rain, even the torrential rain that often accompanies powerful. Springtime storms. Sometimes rain comes down so hard that even your wipers set on high can’t clear your vision while driving in your car, and other times it’s a normal hard raid, but it goes on and on, for hours on end. One such rain happened back in May 2010 when 13.57 inches of rain fell on Nashville in a 36 hour period. Can Rain Damage Pitched Residential Roofs? Asphalt roofing shingles are designed to withstand rain. A normal amount of granules might be displaced, but nothing warranting repair. The risk of damage from rain comes faulty gutter systems. The gutters on your home are unsung heroes. They channel the rain down your roof, down the downspout and away from your home. If this system fails, it can lead to damage. If the rain is not channeled off the roof properly, it can cause what is known in the roofing business as a dead valley. This is where two parts of the roof meet and the water pools, or flows by a vertical structure without flashing to protect the home from the water. This can give water access to under layers of the roof and can lead to leaks. If your gutter system was not installed properly, the water might not flow to the downspout opening and pool in the gutter. This can lead to ice dams in the winter and gives mosquitoes a pace to breed in the summer. If your downspout is clogged, your gutters might spill over the side sending water cascading down, eroding the earth where it lands and creating a wet area where the earth is saturated. When this happens, your foundation is at risk. If there is a crack in your foundation, you can get a leak in your basement. It’s a good idea to check your gutter’s flow and make sure that water is being channeled well away from the foundation. Can Rain damage Flat Roofs? Rain itself doesn’t damage flat roofs, but moisture of any kind loves to find, and exploit, any weak points in the roof. Flat roofs are covered in a type of waterproof membrane. If the roof was not sealed properly, and not pitched properly, you could have problems. Placing sealant on a flat roof is a tricky business and must be done properly to be effective. Tim Leeper Roofing installs flat roofing, and their commitment to excellent service speaks for itself on every roof they work on. The roof must also be pitched properly; this means that a slight angle is built into the roof so that the water flows to the drain or gutters. If ran water pools on the roof, even the smallest flaw in the roofing can allow the water to seep into the underlayers and potentially create a leak that in turn causes more damage in the interior of the building. Tim Leeper Roofing is Nashville’s Top Rated Local® roofer and offers a number of roofing services in the Nashville, Old Hickory, Goodlettsville, and Hendersonville area. Call us today for a free roof inspection.